I don’t know about you, but I have a hard time balancing my love of reading and writing with the art of living well. I have always loved to read. I prefer reading to writing, though I can’t live without writing either. 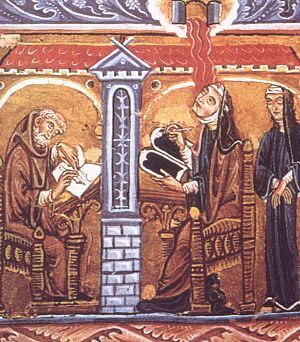 Unfortunately, I’m not quite as blessed as Hildegard of Bingen as shown to the right receiving holy guidance as only a saint can. To this day, years after beginning my journey as a writer, I feel so lucky that I have found ways to make a living as a writer, and live a life of imagination. At the same time, I have often felt a bit guilty about working with thoughts and ideas as a business. I tend to admire farmers, construction workers, marine biologists, athletes and anyone who spends a lot of time immersed in the “real” world as people doing real work. I sometimes wonder if it’s indulgent to be a writer when so many people in the world have to do mind-numbingly difficult physical labor. It almost seems wrong that I can garden for fun and take yearly road trips to beautiful places. But fortunately, I have been reading some great books lately, that remind of why we need writers in the world. Through the writing of others, we get to inhabit other worlds and get a sense of what it is/was like to live in other places and other times either through reading or writing. I enjoy reading the blogs of so many of you — all with your unique perspectives on life, and your contribution to making the world a better place. As I considered how to approach Writing Your Destiny this year, I decided to pick a theme for the year that seems important to so many of us – Integration. To find a way to live a life we love, we must integrate all our disparate parts. One way I am going to integrate this year is to write more about other authors, and the importance of writing our truth. There are a few books that I just finished reading that I am eager to share with you in the next few days and weeks. Here’s to integrating your passions into the most meaningful life you can create this year! Are you struggling with integrating the disparate parts of your life? What needs integration in your life? How do you integrate reading and writing into your life?